Who knew there are so many options to mount the jack. I am leaning toward something like the Dominion Offroad kit that will allow the jack to be stored inside and up high which is space I currently don't use. I am also considering mounting it on my front bumper but really like the idea of having it inside to protect it from theft and the elements. 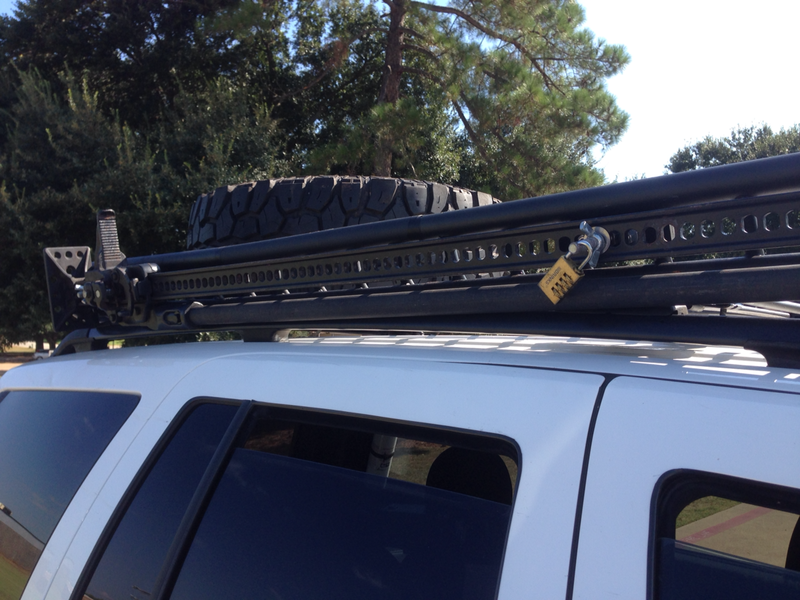 Since I am also building an expedition trailer, I would rather not have it mounted on the back. I am of the impression these jacks though a necessity, are not used often? Opinions and pics appreciated. I don't have a pic but mine is mounted just like the first pic, behind the roll bar. I purchased my brackets from Dominion Off Road. I like it because it keeps it out of the rain and road grime that can cause problems when you need to use your jack but it's been outside for years. Debating on where to mount one myself. Thinking about the roof rack, but I have the same concern as AnimalJK about trying to use it after being in the elements for so long. I will say that everyone I know that has mounted it to the hood has hated it. Maybe there is someone who will chime in and say otherwise, but that seems to be the general consensus. Mounts for these things are ridiculously priced, but search around and there are plenty of DIY options. Here is a link to the dominion off road kit. It's basically two brackets with some crazy bends in them for $69.95. They are very solid and easy to install. Does is rattle very bad in this location? I haul mine on the rear tire carrier(AEV). I looked hard at the dominion mount, but decided against it for a few reasons....It interferes with lowering a soft top, and I was worried about the slightest little rattle being amplified in the cab. My attempt at keeping the jack operable while being kept outside has been simple. First, I don't carry it around everyday, only when off road. I also clean and lube it at every oil change interval, and after every outing. Also keep a can of WD-40 in the Jeep, that is usually enough to get a decently maintained jack working again if it gets covered in gunk. I used to mount mine on the front bumper. The Hi-Lift is a surprisingly resilient tool. I never had any major issues with it being out in the elements all the time, but it did require frequent oiling to ensure it was ready to use when I needed it. I also try to avoid using it at all costs. It can be extremely dangerous. I've heard of broken jaws and lost teeth, and I've personally experienced my own rig coming off the jack once in an off-camber situation. Here it is in-use when I broke a leaf spring centering pin. Notice all involved are exhibiting extreme caution while supported by the jack. Last edited by sjlplat; 03-13-2018, 05:57 PM. hope you don't need it! 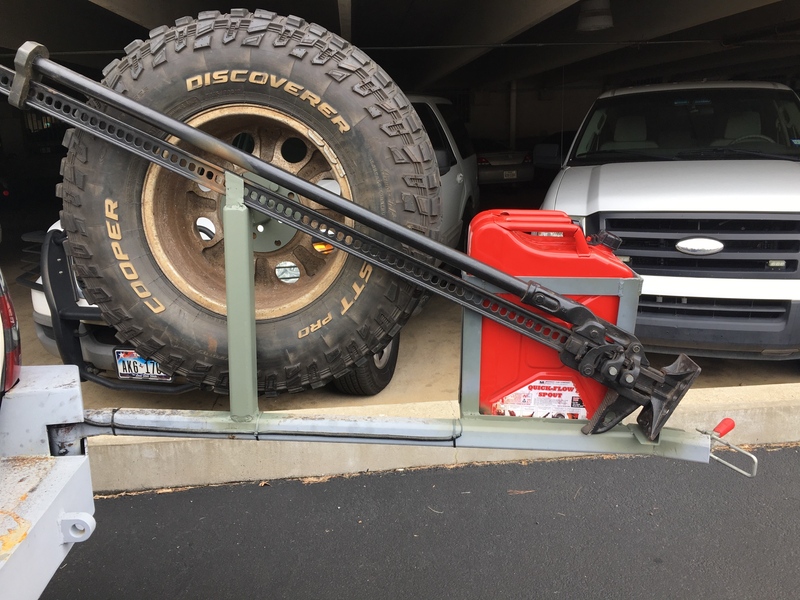 Mine is mounted to my OR-Fab tire carrier. Just mount it to your roof rack like me, Ronnie! 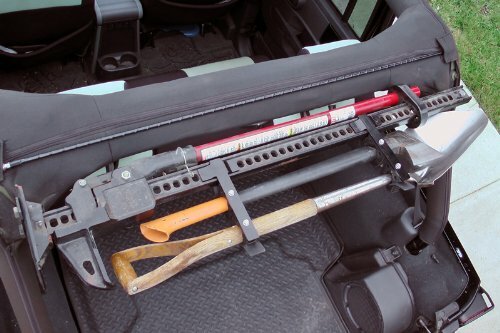 Actually I have found the PERFECT place to mount my jack- on my friend's jeep! learned the big one won't fit under an XJ back seat. moving it to the roof.